Ringing in the New Year with us? Here are some New Year’s Eve Key West traditions to check out. Two hours before the last sunset of the year, Mallory Square has a special Sunset Celebration with night performers, magicians, jugglers and more. Before the parties begin, say goodbye to the final sunset of 2017 in Mallory Square. They don’t call it Key Weird for nothing! This annual event begins at noon on New Year’s Day, which assembles all weiner dogs on the island for a strange little parade. Last year’s walk saw over 200 Dachshunds. Begins at Whitehead and Fleming Streets to Duval. Have a look - it won’t be the last weird thing you see in Old Town that day. In NYC’s Times Square the ball drops; in KW’s Duval Street, a giant high-heeled shoe drops with a drag queen named Sushi inside. This KW tradition began in 1996 and has continued ever since. To participate this year, be part of the big crowd outside the New Orleans House at 742 Duval Street. VIP balcony tickets are also available and always sell out. For more info, check out the event page here. A few blocks away from the shoe drop is the New Year’s Eve Lowering of the Pirate Wench at the Schooner Wharf Bar at Key West Bight. 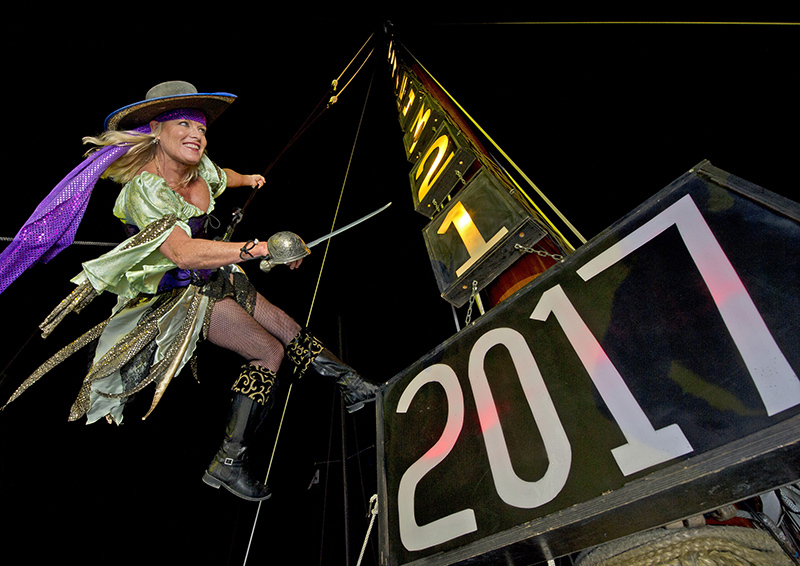 The party at Schooner’s goes until 4 a.m., at midnight the Pirate Wench is lowered down from the top of a ship to the incoming year. Of all the different things dropping off on New Year’s Eve, the Conch Republic’s biggest drop is at Sloppy Joe’s. A giant, lit-up conch descends from above Sloppy Joe’s, and crowd revelers welcome the new year in true-Conch fashion. Outside festivities proceed the drop, with live music and more. Ready to ring in the new year with us? Book now.